To explore the properties of materials and to develop vocabulary to describe them. 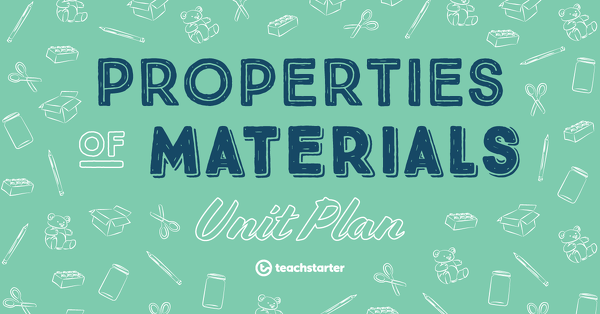 Prior to commencing the unit, develop a classroom display which focuses on the properties of materials. Display word wall vocabulary and learning goals that the students will engage with throughout the unit to stimulate their learning. For examples of additional teaching resources to display in your classroom, browse the Material World collection on the Teach Starter website. It is suggested that several weeks prior to commencing this unit, a note is sent home to parents requesting that students bring in recycled materials to be used throughout the unit. A large variety (and quantity) of resources will be needed for exploration and construction. This will take some time to collect and arrange, however, some of the resources can be re-used several times throughout the unit. A 60 minute lesson in which students explore the properties of materials and develop vocabulary to describe them. A 60 minute lesson in which students investigate materials to determine how much shade they provide. A 60 minute lesson in which students investigate materials to determine how water resistant they are. A 60 minute lesson in which students design and create a 3D monster using objects made from materials with different properties.